Logo derived from a cube merged with hypercube wiring conduit through the middle. The GPLExtek Hypercubes come with wiring conduits across each face to allow signal and power wires to leave one hypercube and re-appear in another hypercube without xyz cabling interference. These trans dimensional hypercube conduits typically carry signal wires such as multi-drop RS485 signals ferry high speed signals between cubes and remote computers. The larger boards have dedicated communications processors with shared memory interface to eliminate the need to learn to program different interfaces schemes. All GPLExtek Hypercubes communicate through shared memory and we will provide identical software libraries in GPL license and commercial license. More boards arrive. Prototype boards assembled into a Hypercube. More boards arrive for Hypercube test assembly. The back of the Hypercube above is connected to a Hypercube Tesseract Assembly. A Hypercube Tesseract embedded supercomputer is low cost and fully interconnected with 3 dimensional wiring to facilitate construction of low energy supercomputer personal robots. 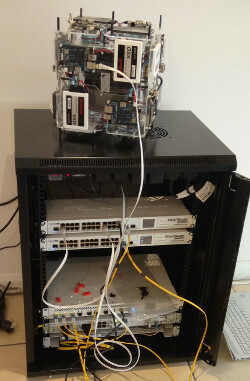 An Automated Test Equipment (ATE) built using Hypercube boards constructed with less space usage than conventional flat or rack arrangement. 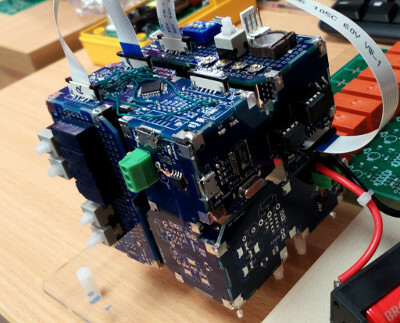 The Hypercube is built from one CPU board, two prototyping boards, 4 Lithium charger boards, two opto isolated 10mbit RS232 boards, and three empty prototyping boards to complete the cube. 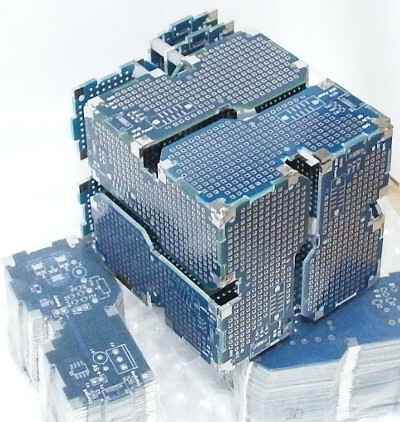 Each Hypercube board has 3 attachment points where nylon pillars can be mounted to connect to neighbours in a Hypercube Tesseract Array. They are convenient points to mount the Hypercube to a laser cut acrylic frame in above photo. Hypercubes can be stunning visually when lit with small LEDs. A Hyperscale scalable Hypercube prototype server based on 2.5" SSDs has been built. This Hypercube server has 44 cores each running at 1.2GHz. This next prototope commissioned is a 48 core 120TB server based on 3.5" disks. Hypercube Servers and Hypercube Tesseract Servers are intended to be stacked in dense 3D wired forms suitable for server farms. The final production version server is a combination of steel and PCB materials compatible with server farms.